This week’s parasha, Vayechi, concludes the first book of the Torah, Beresheet (or, as it is more commonly known, Genesis). We read about the last days of Jacob’s life, and the blessings that he bestowed upon his children and grandchildren before his passing. 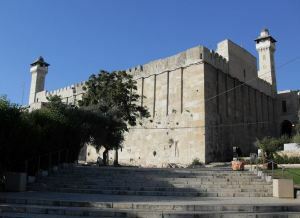 Jacob then instructs his sons to make sure that he is returned to the Holy Land and buried alongside his family members in Me’arat haMachpelah – the Cave of the Patriarchs. Jacob reminds us that this was the place where Abraham and Sarah were buried, and it was where Isaac and Rebecca were buried, and where he buried his wife Leah. This is where he wants to be buried, as well. What is so special about this cave that it holds the tombs of the Forefathers and Foremothers of the Jewish people? The Zohar (I:127-128, Bereshit 57, and Zohar Chadash Ruth 79), explains the origins of this “doubled” cave (the literal meaning of “Me’arat haMachpelah”, likely referring to the fact that there is a cave within a cave, and/or alluding to the husband-wife pairs that are buried there). Originally, man was created to be immortal; there was no death in the Garden of Eden. However, after consuming the “forbidden fruit”, Adam and Eve brought death into the world, while being banished from the Garden. The Zohar says that God prepared a burial place for them near the entrance to Eden. When Eve passed away, Adam searched for a proper place to lay her body. He saw a ray of light emanating from that special place God had prepared, and started to dig there. The scent of the Garden of Eden emanated, beckoning him to dig further and further as the scent grew stronger, and causing Adam to hew out a large cave. (Rashi, on Genesis 27:27, says that the Garden of Eden smelled like an apple orchard.) Adam wanted to dig further, all the way back into the Garden, but a Heavenly Voice ordered him to stop. That was where he lay Eve to rest, and was himself buried there later. Henceforth, the place was forgotten. “…And Abraham settled in Be’er Sheva… And Sarah died in Kiriat Arba, which is Hebron, in the land of Canaan, and Abraham came to mourn for Sarah and to weep for her.” (Genesis 22:19, 23:2) Why does the Torah tell us that Abraham settled in Be’er Sheva, and just a few verses later that Sarah his wife died all the way in Kiriat Arba? Why weren’t they together? Many commentaries have presented answers to this conundrum (see here). One of these is that Sarah knew she was about to die, and went off to find her final resting place. She came upon the cave and her soul left her. When Abraham found her there, he knew that this is where she must be buried. The Zohar says that Abraham saw Adam’s body, and realized this was the world’s first burial ground, prepared by God. How did Sarah know to come there? The simplest answer is that she was a great prophetess in her own right, and was led there by divine inspiration. We may be able to offer another possibility: the kabbalists tell us that Sarah was a reincarnation of Eve, and we know that Eve was the very first person to be buried there. Perhaps Sarah was guided by her soul to the place where an earlier incarnation of her body was once laid to rest. Whatever the case may be, Abraham purchased the cave from Ephron for four hundred silver shekels. This may not sound like much, but Rabbi Yitzchak bar Yehuda calculates that fifty silver shekels could buy an area of 75,000 square cubits, so all together Abraham paid the worth of an area of 600,000 square cubits. A square cubit is roughly four square feet; putting it all together, Abraham paid the price of fifty five acres of land! To others, Me’arat haMachpelah was just an old, forgotten cave that nobody wanted, and the Torah states that Ephron offered it to Abraham for free. But Abraham insisted to pay the full price that Ephron had slyly hinted to. This was to make sure that no one would ever claim the land was not rightfully owned by the Jewish people. After all, our Fathers and Mothers are buried there. Further still, the Zohar states that this site is a bridge connecting Heaven and Earth, a channel through which all souls ascend to the Heavens. This is where Jacob requested to be buried, not once, but twice in our parasha. First, he made Joseph swear to take him to lie with his forefathers (Genesis 47:29-31), and then again Jacob repeated the request to the other sons (49:29-31). This place was of great importance to Jacob, and to all Jews ever since. Over the course of history, it was controlled by many kingdoms, among them the Byzantines and Persians, Arabs and Crusaders. It was visited by pilgrims of all varieties, and has served as a synagogue, a church, and a mosque – sometimes all at once. Today, over 300,000 people continue to visit the Cave of the Patriarchs every year. Despite the fact that some may consider it “an integral part of the occupied Palestinian territories”, as UNESCO has stated, the Cave of the Patriarchs has always meant far more to Jews than anyone else, and will forever remain an integral part of our soul. This entry was posted in Mysteries & Origins and tagged Abraham, Adam and Eve, Apple Orchard, Be'er Sheva, Cave of the Patriarchs, Garden of Eden, Hebron, Herod, Israel, Jacob, Joseph, Kiriat Arba, Me'arat haMachpelah, Reincarnation, Sarah, Vayechi, Zohar on January 1, 2015 by Efraim Palvanov.